Dogs and Christmas - Keep them Safe! Dogs and Christmas time... yes, that sounds busy! With so much going on and so much to do, your pooch can get a little bit forgotten. Most importantly, try to keep to a normal routine of feeding and exercise, which will help your dog to feel less stressed. Actually, the less stressed out that you are, the better! Amazingly, our best friends catch on quickly when we are feeling stress, and likewise become agitated and stressed. This wonderful season is always full of Christmas decorations, parties, food and drink. Unfortunately, most of these things that we enjoy are harmful for our pets. What do I mean? Well, Christmas trees that get put up our homes are covered in lights and pretty ornaments. Problem... all this is very tempting for Fido to chew on. Refrain from putting lights on the lower part of your tree, and make sure that the cords are hidden by a couch, or spray some Bitter Apple on them (will stop the dog from chewing on them, as they don't like the taste)! Also, constantly be on the lookout for stray ornaments and tinsel that can be a choking hazard to your dog. If you are missing something, and your dog has been acting out of the ordinary (vomiting, drinking alot), bring him to the vet immediately to get attention. What about goodies? Dogs and Christmas foods are not a good combination. Apart from making your dog fat from table scraps, poultry bones can easily splinter and choke him. If you or your guests really feel like they need to give him a treat, proved suitable dog treats. Another thing to watch for it poisonous plants. The Christmas season is usually bursting with poinsettias, holly, ivy and other such plants. However, most if not all of these are poisons for dogs and cats. If you must have them in your home, keep them out of reach of your curious canine! Chocolate is also a big no-no for dogs. Although not many dogs are killed by eating chocolate, there are always a couple reports every year. And while your guests may think it would be funny, don't let your dog drink any alcohol. Their systems do not work the same way that humans' do, and they can't handle alcohol at all. A drunk dog is NOT funny! Be sure that your pooch has a quiet, safe place to go to get away from all the crowds, children and excitement. A crate kept somewhere quiet and out of the way is the perfect hiding spot for him. 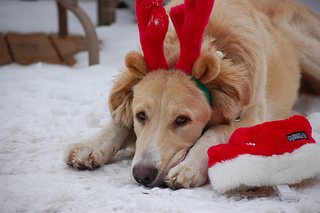 Don't forget - dogs and Christmas don't always like each other! And last of all, if you will be gone on New Year's Eve, make sure that your dog is kept somewhere that he can't hurt himself. Many dogs are afraid of fireworks, and he needs a safe place to go to (a crate) get away from the noise. So make this holiday season a safe one for your pet. Keep these tips in mind as you help your pooch through this busy, confusing time! We here at Precision K9 wish you and your family a safe and merry Christmas!